A good chunk of my nature library is made up of books I accumulated as a kid. For the most part, they remain accurate because animals and their behaviors really don’t change too much over the course of two or three decades. Where they do occasionally need revision, though, is in the range maps. Take the fox squirrel, for example. Thirty years ago, fox squirrels really weren’t a thing in Western New York. Back then, if you did see one in the Empire State, your sightings were limited to the far southwestern corner of Chautauqua County. Their traditional range had them living across the entire central US and then the eastern US from Erie, Pennsylvania southward. Fast forward to 2019; it’s a different world. Now, fox squirrels can be found, though still quite rarely, in many parts of Western New York. The New York State Department of Environmental Conservation says they can be found along the shore of Lake Erie and along the Genesee River across the southern half of WNY. As for this writer, he says they could be found in any woodlot on the Niagara Frontier. All deer season my dad and I watched a hardy specimen on our farm in Gasport in Niagara County. Then, during the Christmas break, I saw a handsome couple a half mile away from where that squirrel had made his home. If you ever see a fox squirrel, you’ll know it because, well, they’re different. Let’s start with the size. Fox squirrels are massive by the standards set by other WNY squirrels. They come in at 12 to 15 inches long in the body, 10 to 14 inches long in the tail, and they can weigh from one-and-a-half to a whopping 3 pounds as adults. That’s twice the total length of a red squirrel, and anywhere from 2 to 6 times their weight. As for the larger grey squirrels with which foxes are often confused, greys are still a third to a half shorter and smaller in length and weight. Those are huge differences. You’ll see that in their gait. Whereas red squirrels seem constantly frantic and grey squirrels have a lot of bounce, the fatter fox squirrels are lumbering. Their rather slow, seemingly defenseless posture is intriguing, because the reds and greys tend to stay next to or on trees while fox squirrels will walk throughout the forest, often many yards away from trees. On that forest floor they slowly search for nuts, acorns, fungi, plant material and, if they’re lucky enough, bird eggs. If those two characteristics don’t nail identification, consider their coloring. The best way to put it – imagine if a red squirrel and a grey squirrel had a giant freak baby…that would be a fox squirrel. Many have a grayish primary to their fur which is covered with vast swaths of chestnut hues on the underbelly and on the limbs (like the one my dad and I routinely saw). Sometimes, fox squirrels might even be entirely rusty in appearance (like the two I saw around the holidays). You never know what to expect with their fur. All of that makes them a sight to see. And, hopefully, it’s a sight that stays with us. 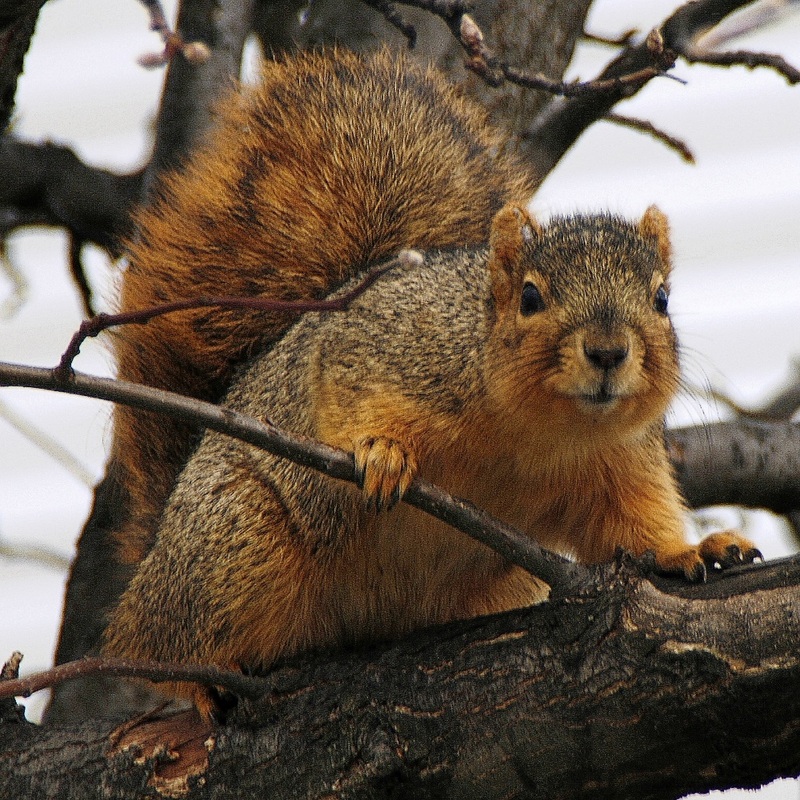 Fox squirrels have a ravenous appetite for nuts and acorns, more so than other squirrels do. As all of the beech trees die off across WNY the fox squirrels’ home turf will be limited to stands of oak trees -- and hickories if you have them. With those beeches going the way of the dinosaur, it’s kind of a bad time for fox squirrels to make their advance across the region – it will really impede their progress or even cause them to retreat. So, if you see one of these giant rodents, count yourself as lucky. They’re hard to find on the Niagara Frontier, a relatively new addition to our already impressive roster of mammals. +Bob Confer is a Gasport resident. His column, Exploring the Niagara Frontier, is published every Thursday on All WNY News. Connect with Exploring the Niagara Frontier on Facebook for conversations about nature and the outdoors in WNY.